The Staunton Farmers’ Market is Open! Is there a more idyllic way to spend a Saturday morning than strolling through a lively farmers’ market, enjoying live music, chatting with neighbors and locals, and selecting something delicious to enjoy later? For 25 years, Stauntonians and visitors have enjoyed the convenience, community spirit, and nutritional benefits of shopping at our open-air downtown Staunton Farmers’ Market. Since it opened in 1993 with just six vendors, the Staunton Farmers’ Market has been a producer-only market. This means that vendors must produce and sell their own products rather than buying them somewhere else and selling them at the market for a profit. Additionally, everything must come from within a 75-mile radius of Staunton. Vendors pick fruits and veggies shortly before the market, and they arrive much fresher than many supermarket items. Tom Womack, market manager of the Staunton Farmers’ Market, is excited to announce that five new vendors, selling items “ranging from fermented vegetables to Peruvian chicken” have joined the lineup. Returning vendors will provide seasonal fruits, vegetables, and herbs as well as meat (beef, pork, chicken, lamb, sausage), and eggs. Vendors will also be selling baked goods, honey, jams, jellies, pickles, relish, and vegetable leathers. If you’re looking for plants, you’ll find perennials, bedding and garden plants, hanging baskets, and cut flowers. Shopping at a farmers’ market should be an easy decision. You’ll have the chance to eat beautiful and seasonal produce, which is packed with nutrients and provides the best taste. You might get to taste something you’ve never seen before. You’ll be able to chat with the vendors to learn about the growing/production process. Best of all, you’ll be supporting the economic and agricultural sustainability of our community (and cutting down on fuel costs and wasteful packaging in the process). The market is family friendly, and you can expect to hear live music at least twice a month along with some other non-musical acts. Enjoy free parking all day! If you’re in town on a Wednesday morning, you should also check out the smaller mid-week market from 7-12 in the same location. The farmers’ market participates in the SMFNP (Senior Farmers’ Market Nutrition Program), SNAP, and WIC programs. Wondering what to do with all that fresh produce? Ask the vendor, or try a website like Southern Living for ideas! Make a morning of it and head down early to enjoy breakfast and entertainment at the Farmers Market. Several vendors are selling breakfast items (and coffee) that range from pupusas by Gloria’s Pupuseria to baked goods by Roller’s Bakery. Find a seat or bring your own and listen to live music before you start perusing the market. 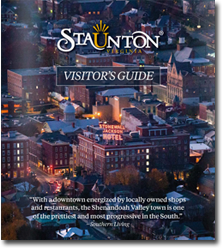 After you’ve checked out all the vendors, take to the streets of downtown Staunton, and visit the many art galleries, antique stores, and boutiques. Refuel with lunch and a glass of wine or even a beer tasting.